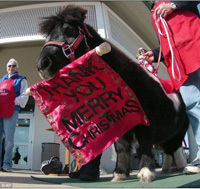 He uses his mouth to holdand ring a red bell and also picks up a “Thank You Merry Christmas” sign. He can also bow and give kisses. 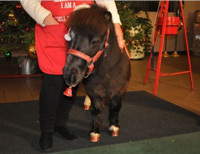 Crowds usually gather to watch the 13-year-old horse and take photos, pet him and, of course, put some money in the red kettle. Major Roger Ross, a Salvation Army commander, says Tinker brings in 10 times the amount of a regular bell ringer in the area. The New York State Police are trying to track down a woman who handed a trooper a Christmas card with $1,000 inside. Trooper Christopher Maniscalco was answering a complaint in the town of Guilderland on Sunday when the mystery woman walked up to him. She asked the trooper if he was busy and Maniscalco responded that he had a few moments for her. The woman handed him a card, Maniscalco thanked the woman and went back to work. After his shift, Maniscalco remembered the card and opened it. By law, the State Police cannot accept the cash and want the woman to donate the money to charity. Troopers are asking for help in identifying the woman, in hopes of thanking her for her gift. The mayor’s office in Yvrac said Wednesday that workers who were hired to renovate the grand 140,000-sqaure-foot estate in November and raze a small building mixed up them up. The chateau’s current owner Russian businessman Dmitry Stroskin was away and returned home to discover his beloved chateau — with a grand hall that could seat some 200 people — was nothing but rubble. Birdwatchers in Sweden were excited to hear reports that an American Cliff Swallow had been sighted near the coast. A crowd of 50 gathered to witness the first time such a bird had ever been seen in the Scandinavian country. Just as they spotted the swallow, so did a hawk, which swooped down and ate it. From MyFoxNY and The Boston Herald.